She is ambling slowly down the path when I feel the words start forming on my lips. I look back at her, and I do not say them. She is leaning over, literally stopping to smell the flowers. If that isn’t a sign, I don’t know what is. This change of pace has made me conscious of how much I rush through life. How often I hurry Madelyn along. I am always trying to get to the next thing. There is an urgency and an anxiety to the daily grind – there is so much to do, and never enough hours to get it done. Now that we have left our schedules behind, I can feel all the gaps in space that I used to fill with “hurry up.” I have to stop myself from saying it over and over again – not because I need her to be quicker, but out of habit. I have to force myself to slow down, because I am so used to rushing. Even now, when we don’t need to get anywhere, or do anything in particular. Modern life encourages us to speed up. We should work harder, go for that promotion, make more money, buy a bigger house, a better car. Take a loan, get another promotion to cover the repayments, get a second car, buy an even bigger house. Use the fancy car to get to the impressive job that means you never have time to be in the perfect house. 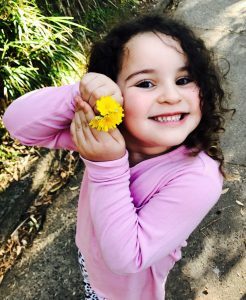 I have been a stay at home mum, a work from home mum, a part time office mum – none of them slowed the pace. There was always something yet to do, somewhere I was falling behind, something that wasn’t enough. There was never enough time to catch up. I was exhausted, but I was still hurrying, like maybe I could out run it, if I could just cross everything off the to do list. And I realise that I can’t think of anything worse. Work days were a write off for us. The time between waking up and leaving the house was hectic. From school pick up to dinner to bed was just as bad. We don’t get any real connection time – we were frazzled from our days, already planning all the things we needed to do for tomorrow, trying to squeeze in dinners and making lunches and cleaning and answering messages and emails along the way. And on days off, it was almost impossible to switch off that sense of urgency. I overscheduled us, made too many plans. I couldn’t seem to stop and just… be. It made Madelyn anxious. Sometimes she would look up at me with big, wide eyes and say “Do I have to hurry, mama?” Sometimes she would rush so much getting ready that she would end up in tears of worry or frustration. I would say “Hurry or we will miss the show. Hurry or we will have to cancel. Hurry or we will be too late. Hurry, hurry, hurry.” And every night when she fell asleep, I would look at her peaceful, trusting little face, and I would promise myself that I would not rush her through tomorrow. I know that sometimes we do need to work to certain timing. We have people we have organised to meet, and their time is precious too. We have appointments. We have tickets. But a lot of the time, we are just hurrying for the sake of it. She wants to feed her dolly before we leave the house. Okay. By the time she is finally buckling her doll into the car (don’t you want her to be safe, mama?) I am ready to cry. But what was the hurry, after all? Sure, kids can drive you crazy. There have been times when I asked Madelyn to put her shoes on, and went in ten minutes later to find her dressed as a ballerina. Or clomping around in my highest heels. Or suddenly completely naked except for her shoes. 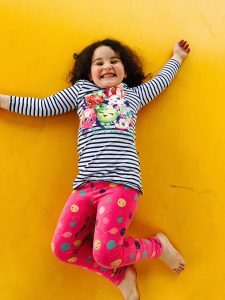 But letting go of the stress and tension that builds when Madelyn doesn’t – can’t – go at the pace I am used to, has made a big difference to both of us. Sometimes it is still really hard, and sometimes I don’t want to wait for her to look under every single pebble at the beach, and I’ll still tell her to get a wriggle on. But not constantly, not rushing every day. She is just going along at her own pace, and getting lost in her imagination. She said once “I just don’t hurry as fast as you do mummy.” And nor should she. Why rush through her childhood? Why hurry from her peaceful little world into the crazy rushed balancing act of modern life? I am learning from her. So, I decided to slow down. Buy less stuff. Work hours that give us the flexibility to live the life we want. It is a work in progress, but Madelyn is blossoming. And so am I. When you finally slow down, there is so much space to be happy.